The General Data Protection Regulation (GDPR) came into force on the 25th May 2018. The fundamental right to privacy lies at its heart: companies can no longer process customer data without express permission and must adhere to stringent criteria in order to use it legally and securely. If not, they can face serious financial penalties, to say nothing of what can happen to their customer relations. The UK Information Commissioner’s Office (ICO) advises that step one in preparing for the GDPR is to raise you and your organization’s awareness. Good e-Learning’s online GDPR Action and Implementation course offers you everything you need to do just that! 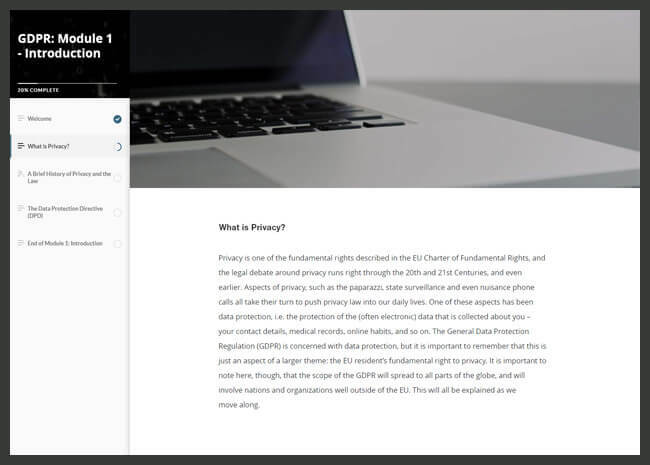 Take your first step to becoming GDPR-compliant with Good e-Learning. We are used to data protection being the realm of digital security experts and IT departments. However, the GDPR places the responsibility of privacy in the hands of everyone in an organization, including those working in marketing, sales, IT and HR, as well as those sitting all the way up in the boardroom. Even though the consequences for businesses are profound and far-reaching (with the maximum penalty being the largest of either €20 million or 4% of the culprit’s annual revenue), a recent YouGov survey revealed that over 70% of businesses have yet to start preparing for the GDPR. Remember, in the event of a breach of the regulations, you will need to show that you have taken the necessary steps toward compliance if you want to avoid the worst fines!  Privacy Notices - Why?  Privacy Notices - What?  Privacy Notices - Where?  Privacy Notices - When?  Privacy Notices - How?  What does a Data Protection Impact Assessment (DPIA) Address?  When is a DPIA Mandatory?  What is a Personal Data Breach?  What is a Subject Access Request? 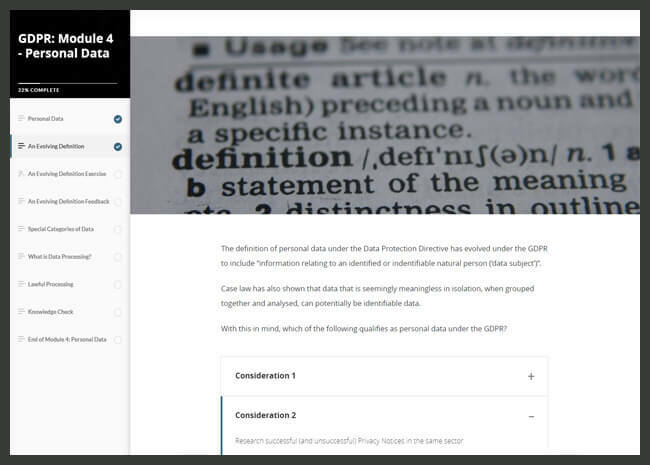 The course puts the ‘legalese’ of the GDPR’s articles and recitals into accessible and transparent language while also offering practical first steps for becoming GDPR-compliant. 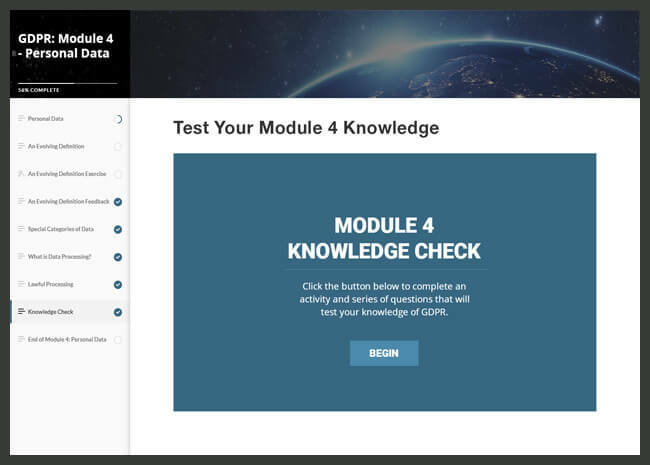 Each lesson concludes with a brief knowledge check to help students consolidate what they have learned. 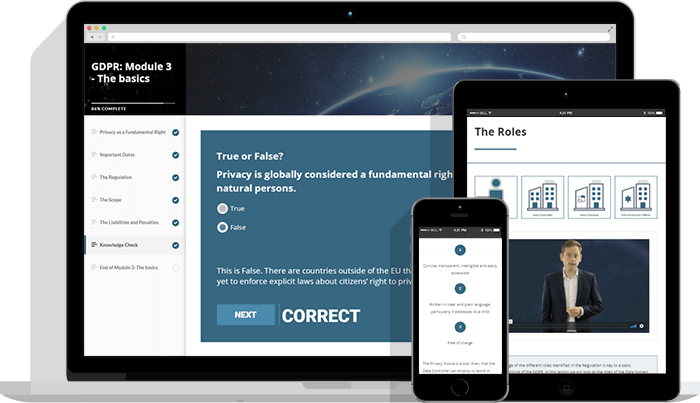 The questions are a combination of true or false, complete the sentence, sorting exercises and the occasional scenario. Feedback is given with each answer to help the learner work through the topics. Students can also enjoy 24/7 tutor support. 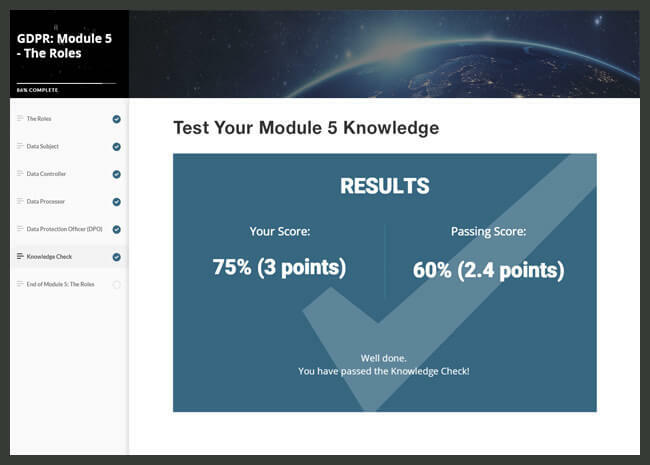 Although there is no official examination or assessment, you will receive a certificate of completion once you successfully finish this course. Training a team? Enquire about our multi-user discounts! Good e-Learning specialize in delivering high-quality, fully-accredited online training to organizations around the world. Clients benefitting from our corporate services include Hewlett Packard Enterprise (HPE), IKEA, Oracle, British Standards Institute (BSI), United Parcel Service (UPS) and many more. Not only do we offer a portfolio of award-winning accredited business & IT certifications, but we can also provide a market leading LMS solution (powered by Docebo), advanced management reporting, and a fully branded e-Commerce shop. Looking to grow your career? We offer a number of courses around the IT Governance & Compliance domain. Just click on a course shown below. For any further information, please contact us.